Kerala State Construction Corporation Limited has issued an employment notification regarding KSCCL recruitment. Interested and talented Job Hunter will have to submit the form to the project engineer, 46 vacancies of Engineering Assistant through online mode and 31 January 2019 before the closing date. 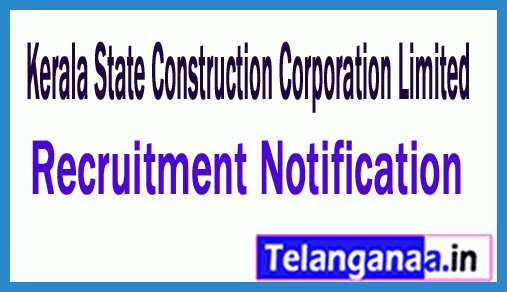 Job applicants who wish to apply for this job opening in KSCCL jobs and can get the rest of the information about KSCCL recruitment 2019 through this page which is created by the team of www.telanganaa.in. Eligibility: Those looking for job should pass ITI / diploma / engineering degree (civil) with a good academic record from well-accredited institution. Applicants who are willing to apply for the above post should not be more than 60 years (post 1,2), 40 years (post 3-5). What amount will I get in the form of a pay band? : Project engineer, candidates nominated for Engineering Assistant posts Rs. Will get remuneration 35,000 / - (post 1), Rs. 30,000 / - (post 2), Rs. 25,000 / - (post 3), Rs. 20,000 / - (post 4), Rs. 15,000 / - (Post 5) which is offered by Kerala State Construction Corporation Limited. Recruitment against this recruitment will be done on the basis of examination, interview, which is to be organized by the recruitment committee. Process of filling the KSCCL application form? Candidates who wish to apply for KSCCL vacancies must go through the organization's official website, http://www.kscc.in. Click KSCCL Recruitment Notification here.